I’ll try best to chronicle some of my craft and painting techniques in this section. Well that’s easier said than done when you have my sentimental over-attachment personality that rivals that of some giant, tentacled creature from mythical lore. Okay…that was a little over the top, I know. 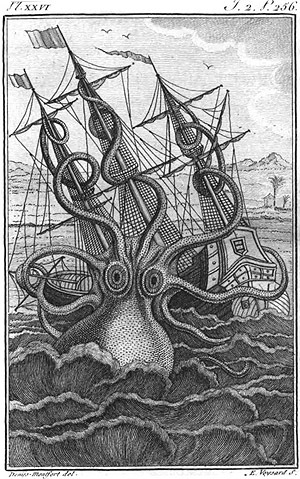 Childhood images of the Seven Voyages of Sinbad came to mind. Apologies. The Big Clean hit theatres this summer. Ahem, I mean my studio. One result was the discovery of a ziplock bag of old watercolour tubes I used to use. ‘Haven’t used watercolors for quite some time and some of the tubes were as hard as rocks. Sure I probably could have performed some grade-8-like biology surgery where frogs have seen better days to gut open the tubes. This would then have exposed cylinder blocks of color that could be revived with a splash of water…maybe. Some of the watercolors still had their original price stickers on them showing their true age. What was I going to do? It was down to that last pile…y’know, the one you’re always left with after a big clean up: paper clips, used popcicle sticks, Q-tips and maybe even some ketchup pack-ettes! At this point you’re feeling like an exhausted god determining the life or hapless fate of your kingdom. Should it stay or should it go now? So here’s what happened. Like something from Arthur Koestler’s The Act of Creation an idea struck me! If it were (a. )no longer useful and (b.) not quite of sentimental value then (c.) it must be a work of art!! And so it became. To do this you’ll want a cheap 8 x 10 canvas, glue gun, matte varnish (waterbased), a couple ( or more) acrylic craft paints and newspaper clippings. You may want to use a small sharp exacto knife to move and place the newsprint cutouts ( unless you have little tiny fingers ). I placed a glittery star in the open space just to balance things out and make some contrast or for some unknown reason. I also dropped a few drops of rubbing alcohol on the fresh paint just to create some subtle rings/texture to the canvas before it dried. 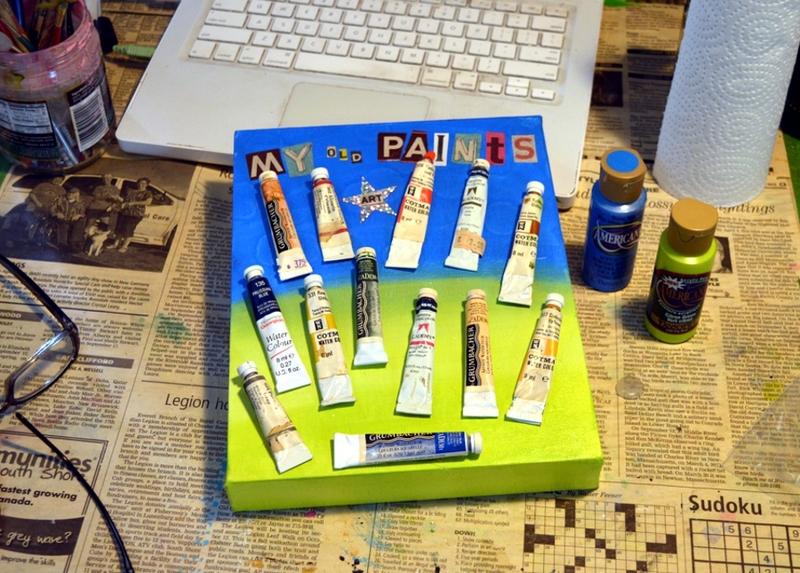 I used the matte varnish to glue everything down including the star ( and except the tubes, of course). I don’t recommend rubber cement for the plastic star as I suspect it would cause it to curl. Not sure. Also don’t forget to place a hanging wire at the back. Practically encapsulating the view from my living room window (in the summer) this is a painting of Cape Blomidon Nova Scotia. It’s painted on a primed wooden disc which is adhered to a wooden laser cut decorative backing. You can get more info here. Things have been rather quiet here punctuated with the odd snow storm and blizzard. I’m afraid I’ve had a grip on the shovel more than the paint brush…but I’m getting there :^) Actually have another one on the easel now…maybe give you a sneak peek next time. Thanks for visiting…see ya soon! I have a niece that’s such a treasure. So I decided to make her something that was just that! Here goes…I’ll show you the behind the scenes. 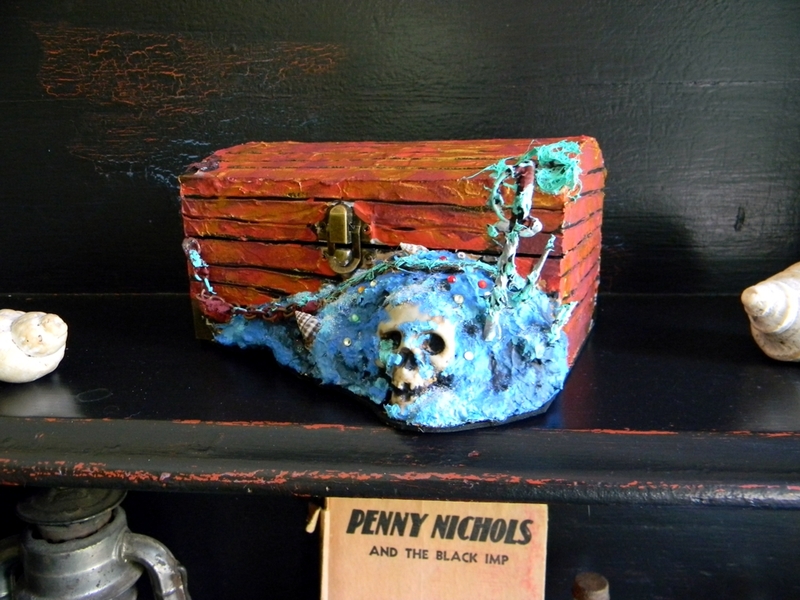 It all begins with one of those unfinished jewelry boxes you pick up at the dollar store and a little plastic skull..the kind you see floating around near Halloween. yeah I keep a couple just in case…you never know when you’ll need one. Here’s a gallery of photos followed by some brief observations. So here’s some details. I believe my time is worth something so instead of spelling out every step and listing every ingredient if you want to know how I did something…just ask me. I’ll gladly share the info and you can improve on it or do it your own way. 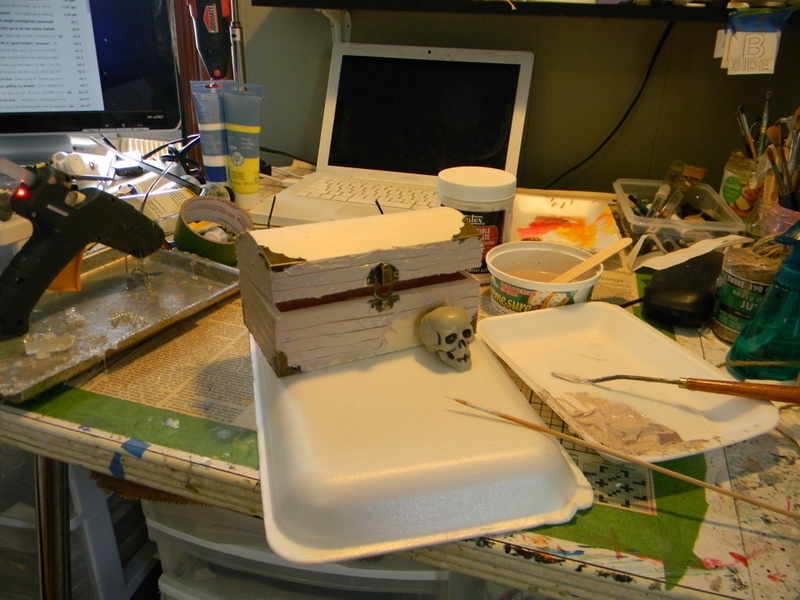 The skull was hot glued onto the plywood box. The box was covered with a flexible modeling paste and while the paste was still pliable a skewer was used to draw lines through it. A 50/50 mix of white glue and water was used as paper mache mix. ‘This case I made it a little too watery. I used some masking tape to fill in the space around the skull. Then globs of glue soaked paper towel was sculpted around the skull to form a 3D base. A more pulpier mix of toilet tissue was then applied. Everything was left to dry. The skewered furrows on the box were painted black. 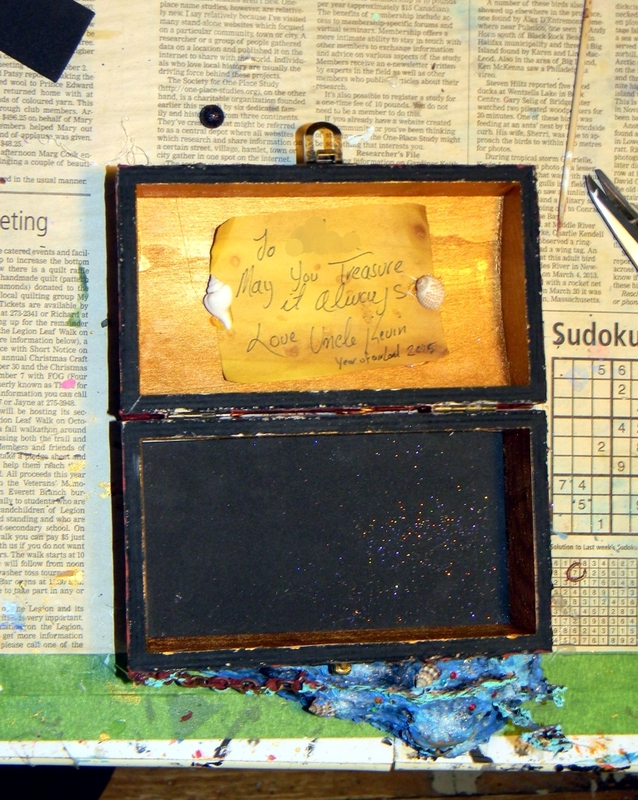 The inside of the box painted gold. The rest of the outside of the box was painted with a couple brown tones including Americana Georgia Clay and touches of gold paint. Paint different colours together wet so they blend…get messy, ha. Also there is a thin sheet of foam cut to shape cemented (rubber cement) to the very bottom of the whole box. 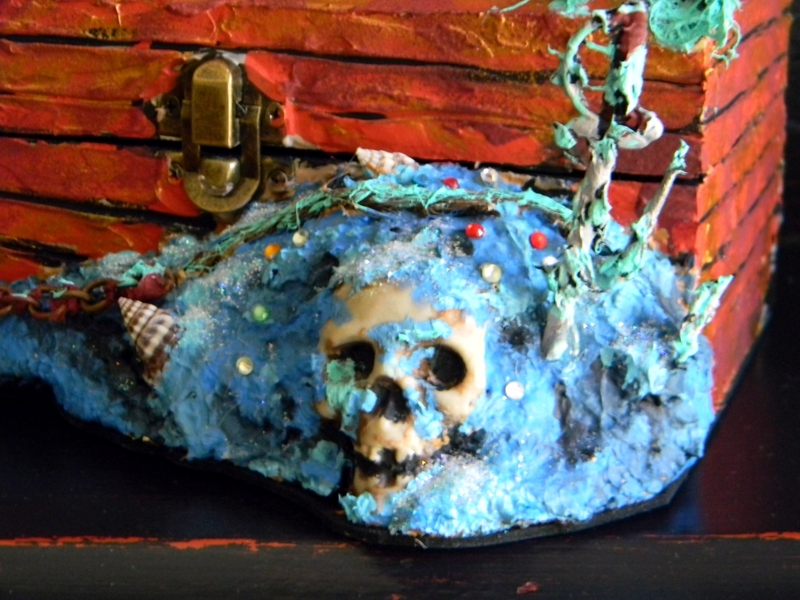 Add details to the mound like pieces of chain ( necklace jewelry chain), twine, seashells etc. paint it blue tones ( wet-on -wet). As it all drys you can add sparkle mixed with a clear medium, etc, etc lots of details..ask me if you have questions. The final touch was gluing in a sheet of foam to the bottom and a little personal note of which I purposely left out the name. Okay. Hope this inspires you to do something creative! thanks for stopping by! 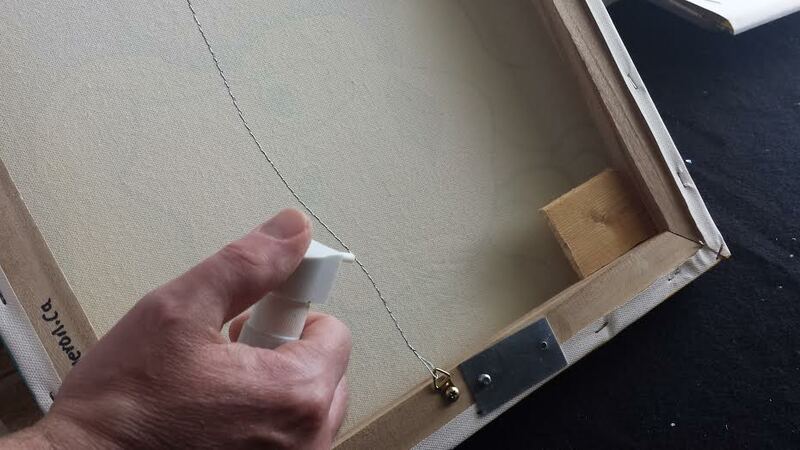 There’s a bit of ‘photo-shopping’ going on here as I have pasted one image over another before actually gluing the rope to the board on which the painting is on. The border/frame of the paintings are both gold. As you know, gold can take on different hues. Example: Venetian Gold looks different than Emperor’s Gold, etc. It would be really appreciated to have your opinion on which gold you think looks best or more fitting. There are different paintings in this series other than the lighthouse at sunset. So it may be best to not focus on which gold goes best with the lighthouse only. (Another sample here). As always thanks for your input. I will be asking on facebook as well here. Announcing the latest from my portHole’s collection. This original hand-painted acrylic measures 7 inches (18cm) and is ‘framed’ with a golden painted rope. It is complete with a convenient twine loop so you can hang it wherever you like. Perhaps in your home or home away from home. Whether you live by the sea or have fond memories of having done so this painting is a reminder of our close ties to the ocean and the importance of our continued appreciation of it and its place in our lives. I grew up near the Atlantic Ocean on the South Shore of Nova Scotia and even painted some real life size boats (not schooners, lol) for employment. Please check out my other items for sale at OceanSky Art (also found on my website) and revisit as I have some new offers and product for you. Thanks! How can you Mend a Broken Art ? The above painting called “Blind Girl” ( there’s a story behind that name) has been posted before but this time with a different purpose. Recently it was on display at a local gallery and when it’s display time was up I had to go fetch it. When I got home I then noticed the DAMAGE! 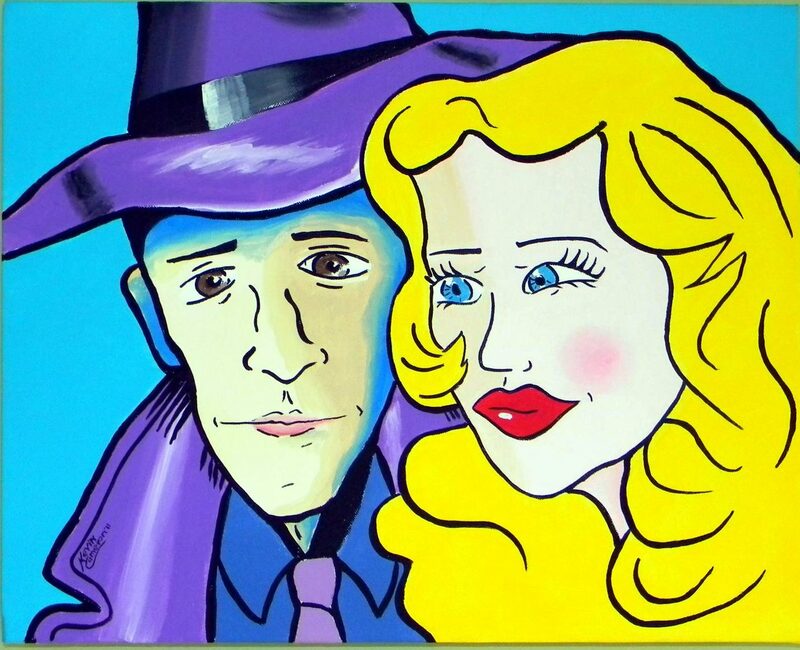 Gallery’s have waivers that all artists sign which is a contractual agreement between the artist and the gallery regarding insurance, damages, etc. In this case the gallery having done all in it’s power is not responsible for any work that incurs damage during it’s stay. I signed the waiver so I took the chance. However obviously I was a little disturbed about it. I was thankful that it wasn’t one of my more expensive pieces that had been on display….this time. Here’s how it looked after i got home. The green arrows point, of course, to the resulting damage. I won’t say which gallery it was hung at but I will say, that to me, it looks like the impact of a runaway gurney. The paintings to be hung are on the floor and leaned against the walls during their changeover, etc. 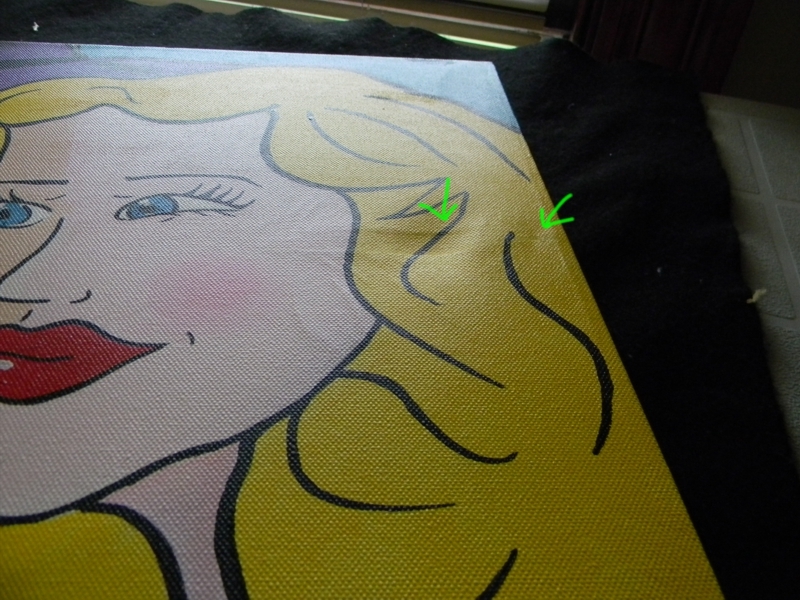 You can see that the canvas on her cheek is wrinkled and there is about a half inch indentation near the frame and almost a tear right next to it. How can you mend a broken art? Disclaimer: A professional painting restorer I am not. Although I do have years of experience with numerous kinds of paint. Step 1. 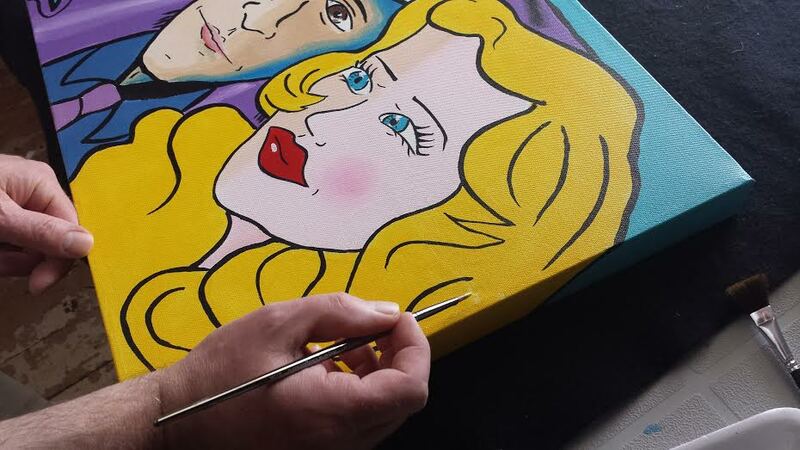 It seemed the best thing to do was start with a stretched or tightened canvas. This was an inexpensive gallery wrapped frame ( and my low price for the painting was reflective of that). First the painting is flipped over revealing the back side. here you can see at the corners of the frame that two wedge shaped or more like rhomboid pieces of wood (canvas wedges) are tapped in to spread the corner of the painting apart slightly and resulting in a tighter canvas. These are unusually large wedges that I had to make because the slots in the back were unusually large. 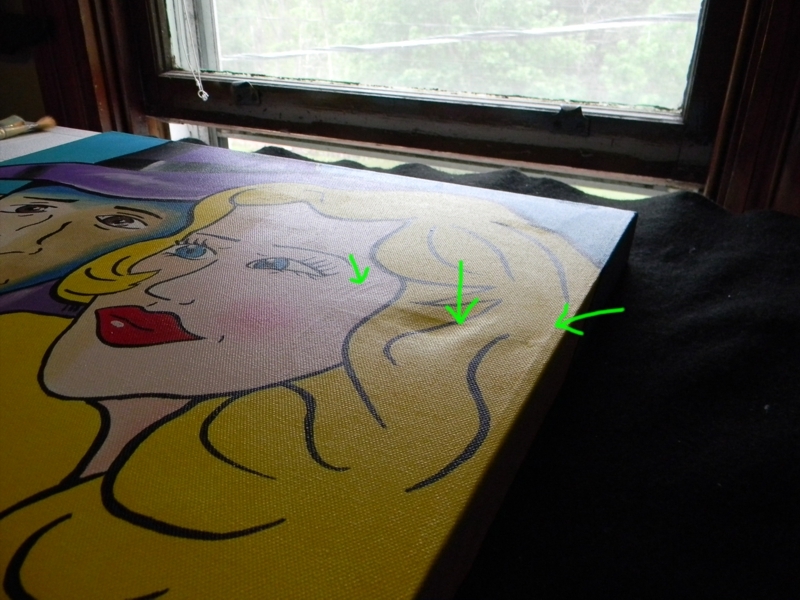 The second thing that was done to tighten the canvas was with the use of fine water mist sprayed on to the back of the canvas in the general area of the damage. Soaking the canvas is NOT a good idea. I didn’t want the surface coat of paint to become so saturated with water that it might peel off. 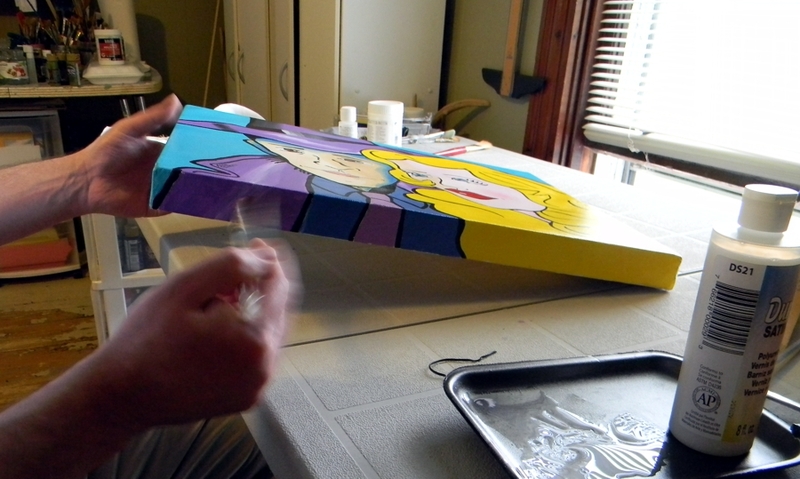 A Hair dryer was then used to dry the back of the canvas quickly. 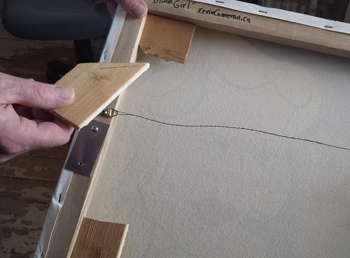 With the really cheap non-cotton or vinyl canvas this trick will not work. A small round brush was used to paint over tear mark. When the touch up paint was dry I gave it a final coat of satin finish. You can see the results below. To be honest, at a certain angle, you can see some discolouration but for the most part the indentation is gone and things didn’t turn out too badly. Hope this info helps. Any questions or comments, just leave below. O one more, thing. In this case the canvas wedges were quite heavy and I may need to attach a little weight to the other side so the painting hangs more balanced on the wall. In the last post I promised to give you a quick tree craft for decorating purposes. This arose from my need to create small trees for my glitter houses and especially for the tree-yard trailer model that I built which you can see above. For a smaller tree ,first fold the bristol board in half along it’s shortest width. Second draw a semi-circular shape that will fold into a cone (see above). I’ve drawn the cone shape in white chalk so you can see it. A black marker will do and you won’t have any white lines showing through the ‘branches’. Using the scissors cut out the shape you drew. Roll it up into a cone shape such that the base of the tree is as flat as possible ( so it will stand properly ). Use a stapler to secure it as a cone shape and hold it ready to be glued. Next glue along the seam. Hint. I use a pen or something to press onto objects being glued so I don’t burn my little fingy’s. Start at the top and tack the end of the garland on with some hot glue. Wrap the garland tight around the cone gluing here and there as you wind your way to the bottom. Honestly this is an affordable way to make a decorative tree which will basically cost you only a few dollars a piece, if that. Always use cold lights- low watt LED’s for lighting around cardboard. Someone googled and visited my last post asking why does their paint “flake” on cardboard. The only answer I can think of is that the cardboard may be coated with a waxy or oily finish. Use cardboard that does not have a water resistant finish or you can try painting ( or spraying) it with an acrylic sealer first. The finished tree with some decorating hints below. Last, I will leave you with a bonus photo of another glitter house/church that I built from cardboard. Not sure if I will post anymore until after Christmas so I want to wish you all a Merry Christmas and a safe holiday. For those of you who don’t celebrate this particular season I hope you will have a safe and good time with your family and friends! You’re gonna need lots of cardboard for this project! It all began when I saw this picture of a little glitter house on the net. “Wouldn’t it be cool to just build a big one,” I thought! The redeeming thing about a glitter house is that they are intended to be cheap tiny houses in which a light was inserted through the back or the bottom for Christmas decoration. This means you don’t need to fuss. These houses were only a few inches big to begin with. If you do need some good cardboard then take a visit to the back of your local mall (shopping center) where some free cardboard may be had in the recycle dumpster. Or ask the store managers themselves. They will be glad to get rid of the excess cardboard this time of year. These are simple shapes of course. Simply cut out the size you need and if you need to use more than one piece then use masking tape on the back side to attach the side walls. I use Jo Sonja’s all purpose sealer and paint it on with a brush first. 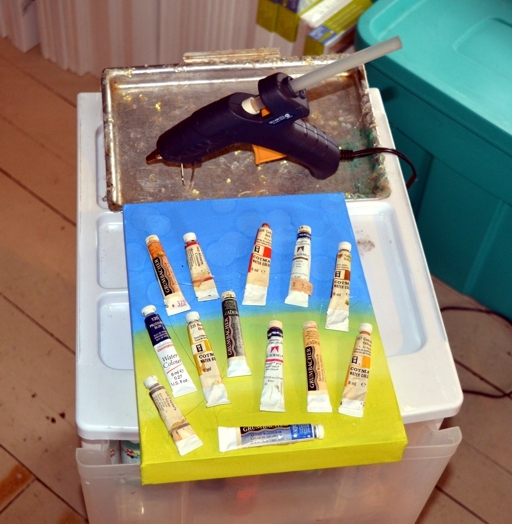 This seems to keep the acrylic craft paint from sinking in too deeply and looking washed out. However you will have to do a couple coats of white over the sealer as a base coat. The little blue strips are cardboard as well. The ones at the top of the building are folded in half and glued over the edge for strength. I actually use white glue for gluing as well as a hot glue gun to tack everything in place. When the white glue finally dries it will be very strong. In the above photo you can see that I added some areas of snowy glitter. These are shapes of painted cardboard tacked in place with a hot glue gun. 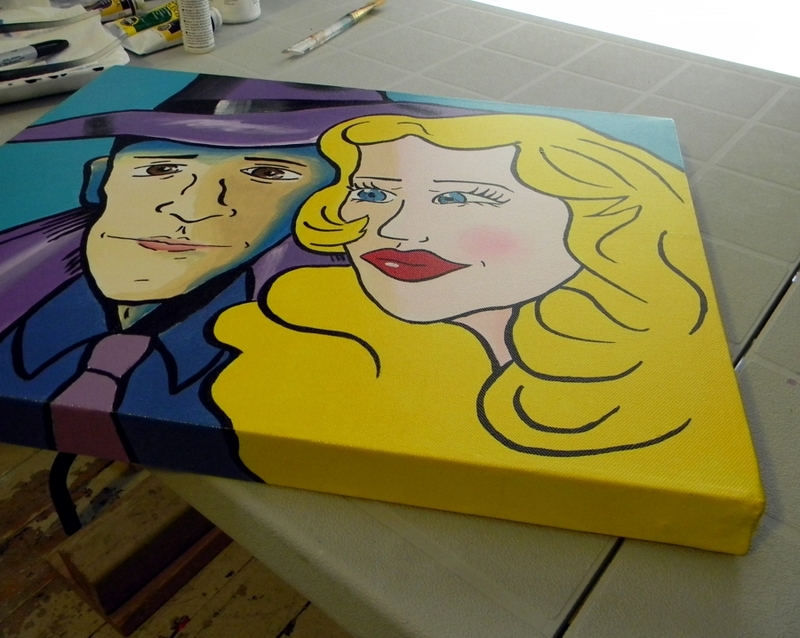 The shapes are thickly painted with a Gleams acrylic pearlescent paint. While the pearly paint is still wet I shake some iridescent snow flakes onto it and use a piece of cardboard to gently press them down into the paint. When the paint dries the flakes are glued to it loosely. 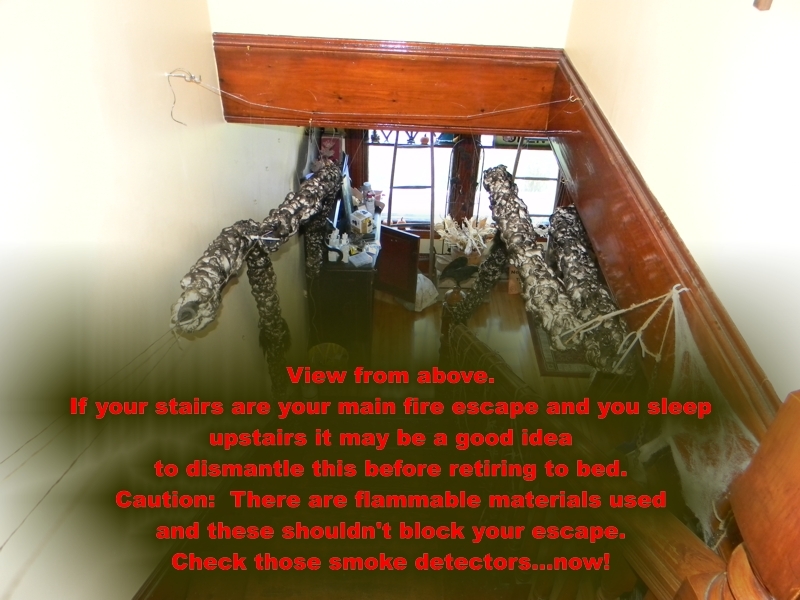 I recommend using low heat/low watt bulbs in the back to avoid risk of fire. This original 8 inch painting based on Nova Scotia’s Bluenose schooner is getting attention at my Etsy store OceanSky Crafts . Several people have already added it to their favorite list and that’s great. I call them PortHoles for obvious reasons. There are two others to choose from but this one seems to be the most popular. They are listed as Limited Edition since I only have a few on hand and I’m not sure if I can get the wicker rings at the same previous low cost. Here is a close shot of the bow of the ship. 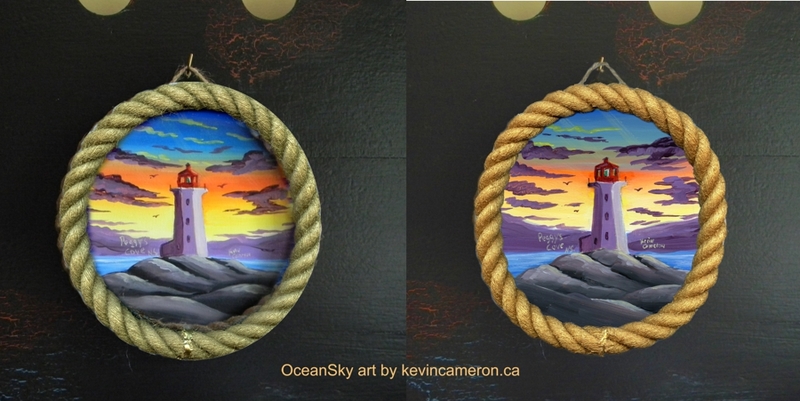 OceanSky Crafts (me) will ship, pardon the pun, to U.S.A. or Canada. Any other destination may require special arrangements. Thanks for visiting! 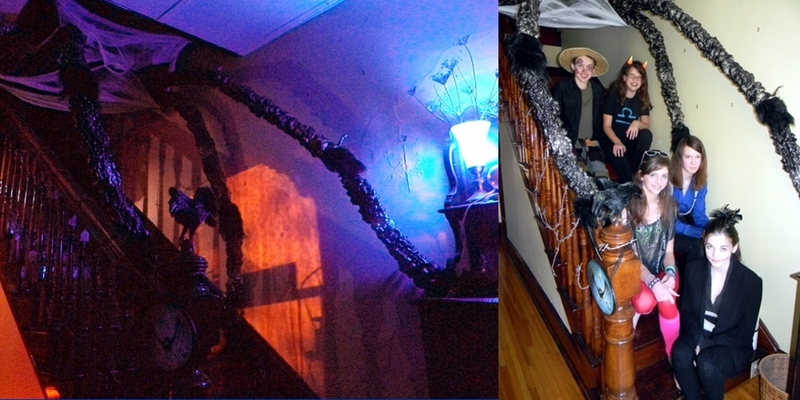 Or how to make a giant spider living in your stairway! Below you’ll see some shots of how to assemble giant spider legs. 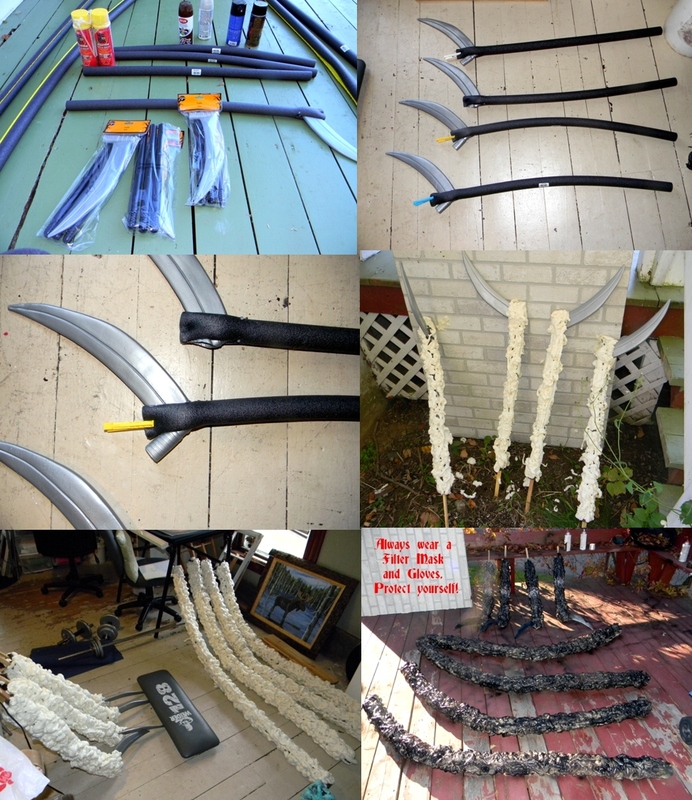 These are made from 4 store bought grim reaper scythes (claws/talons), several foam pipe insulators ( 4 small -3 ft and 4 larger ones-6ft), about 5 cans of spray insulator foam, black , brown and silver spray paint, faux fur, clear vinyl tubes and wooden dowels. 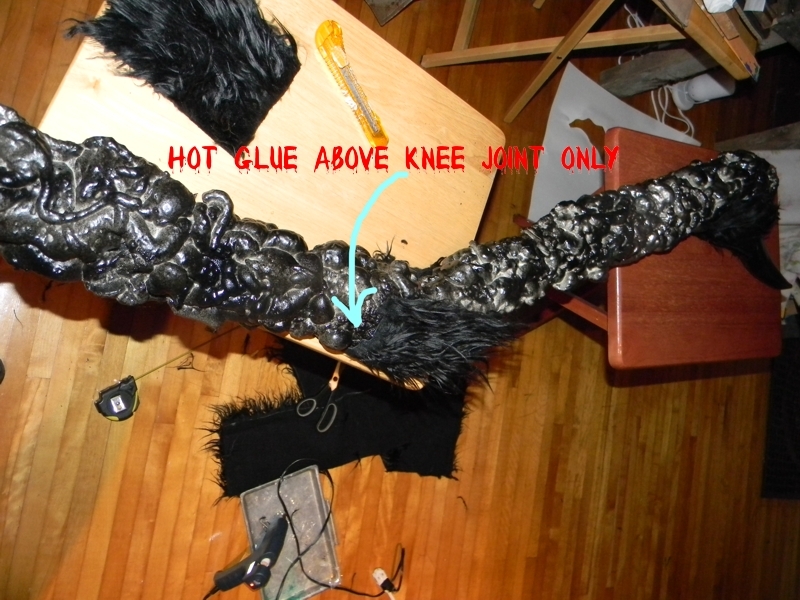 First you cut a slit in the foam insulator and then insert the claw into the slit and hot glue it. Clothes pins were temporary holds. Trim off the excess grey plastic from the claw (heel). Outside lean the legs against a backdrop to catch overspray of foam. 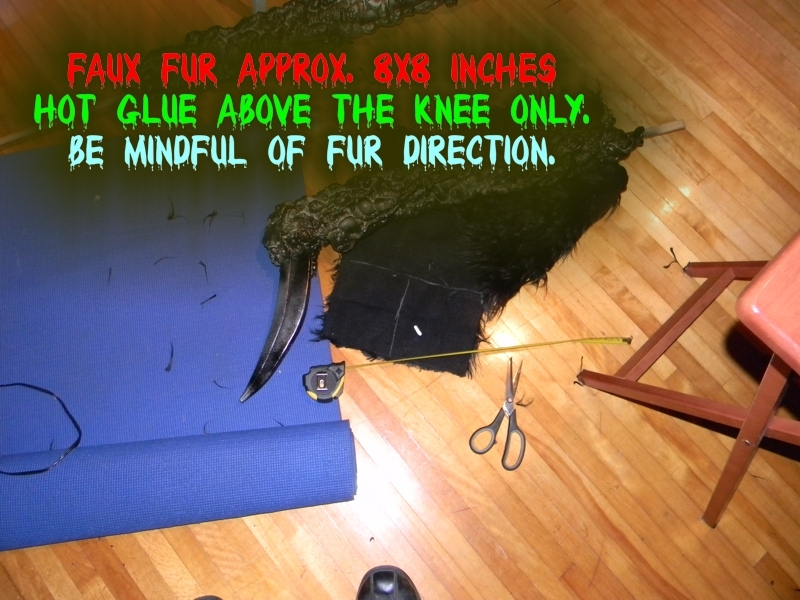 The legs must be as horizontal as you can get them for the foam to stick. With the larger upper leg parts I laid them on the grass. This will take several coats. Let them dry some in between coats. Next take them outside and wearing a filter mask spray paint them. 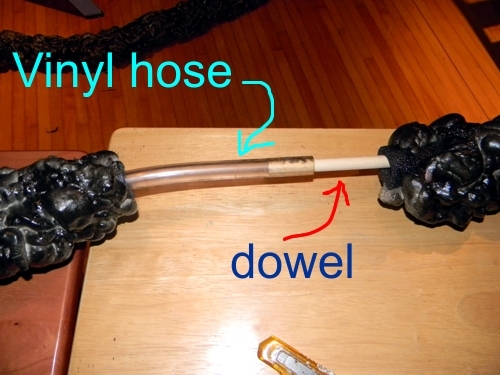 Four of the knees are made with this dowel and vinyl hose arrangement. The four other knee joints were made by simply cutting a slit in the 6 ft foam insulators. This allows the knees to bend without using dowels and hose. In other words start to cut the pipe insulator as if you were going to cut it in half but only cut half way through allowing the pipe insulator to bend. The legs are suspended with twine and fishing line. I spun some fake webbing around the base of the legs to ‘hide’ the obvious fact that there is no more to the spider illusion than the legs. You could hang strips of black material as well. I was also planning on experimenting with a curtain rod ( telescopic type) that would span the opening of the stairs. The legs then could have ‘dangled’ from this move-able rod. Another tip is to use H2O Krylon low odor spary paint. It dries really fast and leaves little noticeable fumes. 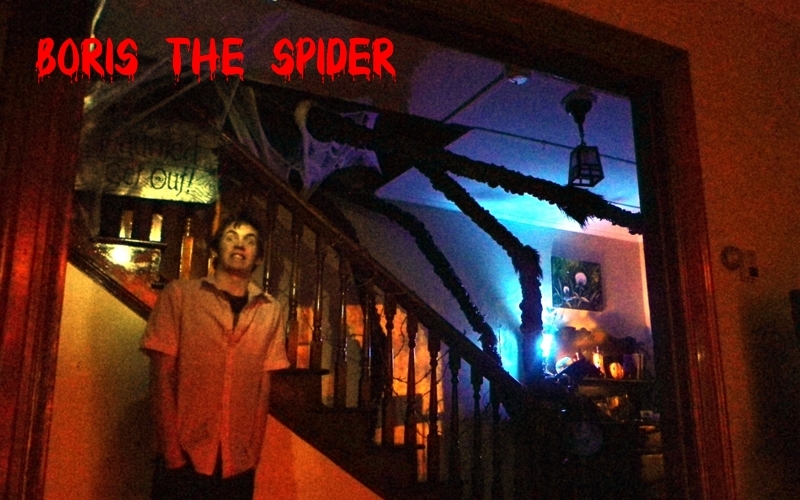 A final combined photo that includes some friends of my daughter that enjoyed Boris the Spider during her Hallowe’en party. This is a project I wanted to undertake for a couple of years and I’m glad I got a chance to do it. Hope you enjoyed it and that it gives you some ideas for your own projects. You can adapt things to what you have on hand. You could use flexible (accordian) hose for knees, etc. I also inserted small dowels in each section of leg to help strengthen them. Good luck! Happy Hallowe’en!!!! !